An Ohio State University student was shot dead by police after he plowed into pedestrians with a car and then stabbed multiple people with a butcher's knife at the OSU campus in Columbus this morning, officials said. The scene is now secure, officials said. Eleven people were transported to local hospitals, officials said. One is in critical condition. OSU said in a statement that the "injuries include stab wounds, injury by motor vehicle and other injuries that are being evaluated" and that "facts are still being verified." The incident was reported by OSU officials as an active shooter warning shortly before 10 a.m.
Less than two hours later, OSU police said the scene was secure and police lifted the shelter-in-place alert. The incident happened at 9:52 a.m., when the suspect struck pedestrians with a car, officials said at a news conference. The suspect then exited the vehicle and used a butcher's knife to cut multiple people, officials said. An officer then shot and killed the suspect, officials said. The suspect was identified as Abdul Razak Ali Artan, an OSU student, officials said at a press conference this afternoon. Officials said Artan was in a car alone when he struck about eight pedestrians. The motive is not known at this time, officials said. 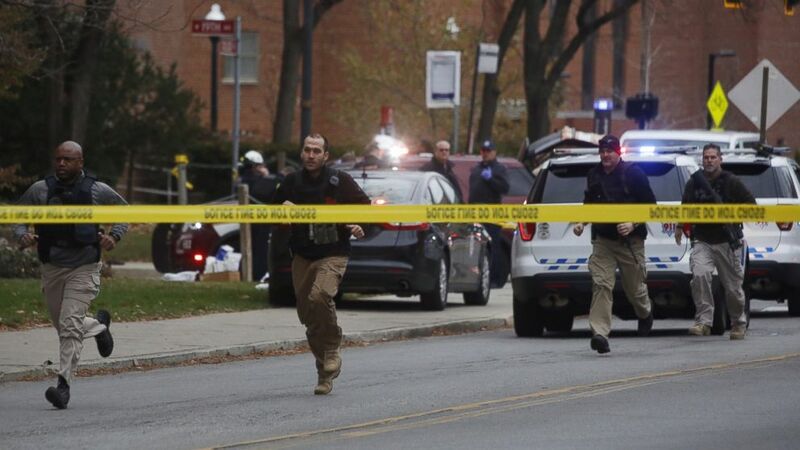 Sources told ABC News that authorities believe the attacker is of Somali descent and is a legal permanent resident of the U.S.
Sources also said authorities are looking at a Facebook post to determine if it is connected to the suspect. The post reads, "I am sick and tired of seeing my fellow Muslim brothers and sisters being killed and tortured EVERYWHERE ... I can't take it anymore. America! Stop interfering with other countries ... [if] you want us Muslims to stop carrying lone wolf attacks." The man who fatally shot Artan was identified as OSU Officer Alan Horujko, 28, officials said. Horujko has been a member of the OSU police department since January 2015. "It helped the officer be in the right place at the right time, as he was able to see this whole thing happen and take immediate action," an official said at a press conference this afternoon. When the active shooter warning was sent out this morning, some students barricaded themselves in classrooms. One witness was Kendrick Price, an academic adviser at OSU, who told ABC News he ran to his second-story office window after hearing screams. He saw a person running toward police who was then shot multiple times, he said. Sophomore Jacob Bowers, 20, said he was sitting on a bench listening to music before class when he saw a man pull "a large knife" and start "chasing people around trying to attack them." "Luckily there were so many people, he couldn't focus on one target," said Bowers, who did not witness anyone getting stabbed. "I saw the police officer take down the stabber. He saved lives today." He said he did not hear the assailant say anything, "which was almost scarier." FBI agents were among the authorities who swarmed the scene in response to the active shooter report. After the scene was secured, OSU police said all classes at the Columbus campus would be canceled for the remainder of the day. Nearly 60,000 students are enrolled at the Columbus campus. Ohio Gov. John Kasich said in a statement, "My thoughts are with the victims of this attack right now, and I pray for their safety and recovery. I am grateful for the professional, coordinated response from first responders, whose efforts helped effectively contain this incident before further harm could be done. I have been staying in contact with Ohio first responders since the incident began and have spoken with Ohio State's president, Dr. Michael Drake, to pledge whatever additional help the university needs." Kasich postponed an event scheduled for today in Dublin, Ohio, because of the shooting. Columbus Mayor Andrew Ginther said in a statement that he met with several victims and is "pleased to report that their spirits are good and they are receiving the best of care." "The City stands with The Ohio State University in supporting all those who were impacted by today's traumatic events, and will work with Ohio State to help the university community heal physically and emotionally in the days and weeks to come," Ginther said. "It is important in these difficult times that we come together as a community to support one another, and to resist the temptation to lash out in anger, or to let the actions of one person define an entire community. As an open, diverse and inclusive city, it is especially important to stand with our entire community and work toward productive strategies to stop senseless acts of violence everywhere." ABC News' Ben Gittleson, Jennifer Leong, Meridith McGraw, Devin Villacis and Jason Volack contributed to this report.